I wrote a post recently on my travel beauty essentials for a lovely travel blog, Eat Travel Love. I thought for anyone who missed that though, that I would write a smaller version for anyone going on their travels very soon. 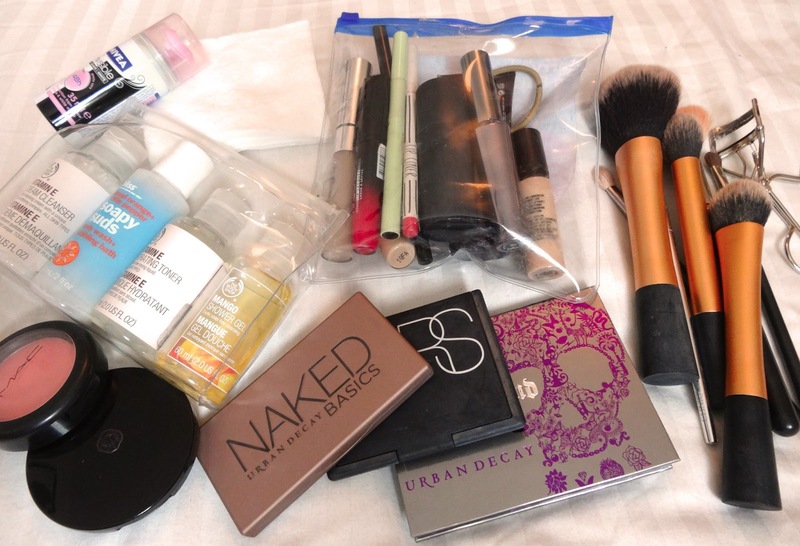 I took a trip to Berlin a few months back and travelled only with a backpack for one night, so I had to make sure that any toiletries and cosmetics fit inside clear plastic bags. I found that what I took was perfect for what I needed, consisting of makeup for the daytime as well as enough make up for an evening event. Im also travelling to London today, so I will be taking practically the same kit. First of all I took a range of brushes to allow me to bronze, blush, buff foundation, contour as well as apply eye makeup. the majority were from Real Techniques with the eyeshadow brushes being from MAC, mainly my trusty 217 blending brush. I also added my eyelash curlers as I literally cannot live without them. In terms of compacts, and items that are non liquid and could therefore fit in my bag freely, I took the Urban Decay Ammo 2 which consists of 10 best selling Urban Decay eyeshadow shades and gave me a choice of looks. I also took the Naked Basics Palette for my eyebrows but also for matte eyshadows for the journey home the day later. I took my much loved Nars Laguna Bronzer for contouring and bronzing and the Shiseido Translucent Pressed Powder for setting any makeup, both amazing products. I only took one blush from Mac as I adore this shade, Rosy Outlook, perfect for a rosy, coral cheek. For toiletries, I make use of tiny bottles of Body Shop facial products as they are amazing for trips away. You can buy a small set of skincare products from the Body shop which I carry with me for any over night stay. I took the Vitamin E Cleanser and Toner for removing all makeup and also took a small bottle of Johnsons Exfoliating Facial Wash, concealed inside an old Bliss bottle. A tiny Body Shop Mango shower gel was perfect for a quick shower and along with a few cotton pads for removing makeup, it was all I needed to be clean and fresh. I took a tiny Nivea Deodorant along also. When it came to liquid make up products, I went with cosmetics I knew I could trust. I took the gorgeous Laura Mercier Silk Creme foundation with me for the evening as there is nothing that is so flawless, and for the day I had a tiny sample of Nars Sheer Glow, again opting for tiny sizes of anything I could. I took my MAC pro-longwear concealer as it does not budge after being applied and the Nars Multiple in copacabana as a highlight. Aside from this I took my Benefit Theyre Real Mascara as it really does brighten the eyes, Rimmel Apocalips in Apocalyptic for if I was feeling daring and a Topshop lipliner for the same reason. The perfect amount of products for any occasion or situation and not too heavy for carrying around. I hope this might have inspired you if you are tripping anywhere soon. Have fun!